As standard, you will automatically have access to a range of templates to build events with. 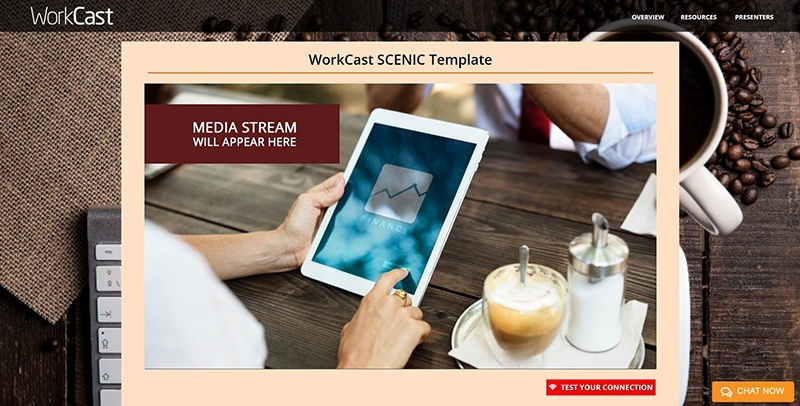 If your license includes or if you have purchased a custom template, WorkCast will customise a template of your choice (examples below) and ensure it reflects your brand. The templates are fully responsive to work across desktop, tablet and mobile devices. This means templates will automatically adjust according to the device you are viewing an event on. Your account will already contain a number of templates for you to choose from for new events. Below you can view live versions of which templates can be chosen from for custom templates. These include a Registration Page, Email Confirmation, Security Access page and Auditorium. 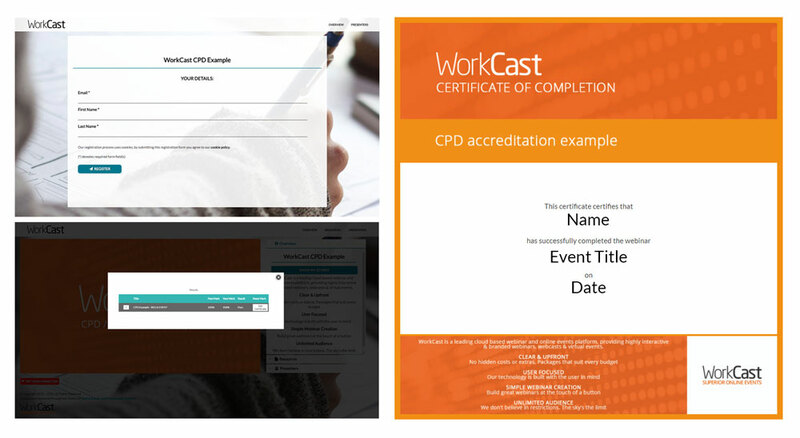 Certification events can be set up within the WorkCast platform; using Polls, you can set up a set of multiple choice questions, percentage pass mark and also a customised printable online-based certificate. Click here to see an example of how this process works; clicking 'Show My Scores' will display your personal pass rate and display a link to view your online certificate after answering the three questions correctly included on the example video. Depending on your event setup, Security Access pages appear before you enter the auditorium page. The background colour of this page can be changed and can include your company logo. General text heading styles and font colours can be changed within your template. Fonts can be set to any standard web safe font or Google font if required. Media windows within your auditorium display a 16x9 splash image if media is not yet streaming or is set to On Demand. This acts as a 'holding image' and can include photos, graphics and text. You can change this image per event. If you think a background image would benefit your page but don’t have any particular in mind, our designers will happily suggest an appropriate image to reflect your brand. Emails display your company logo and will pull through a sponsor logo if you have uploaded one. The banner image and background colours can be set within the template. For the best results, please provide your company logo as a transparent PNG and at least 500px wide. For background images please send the biggest version of the image you have available as either a transparent PNG or JPG. Our designers can optimise images appropriately. We recommend that images intended to be used as backgrounds be at least 2100px wide and 1000px high. Email banner images will display at 600px wide. Images must either be part of your company’s brand, bought with an appropriate license or be free from copyright restrictions (a CC0 License - more information at the link below).